Leaders of the Dark Knights: What do they mean to you? WOOOHH!!! Quick, whats the Rock mean to us? For Nesanel? I would say calm, strict at times, but also humorous at times, good organizer and collaborator. If Dart reminds me of a war general, Nesanel reminds me of a successful and productive bussiness man. So you are saying that Nesanel is choleric personality type? @ Gengkiskan: New avatar and sig? Nice. @ Tigirosa: It's certainly possible that I might be. But I'm also extremely considerate of others, regardless if they've hurt me in any way (like bullying), because if something bad has happened to someone, even a bully, I try to make things right and help. Also, about the choleric personality, I do try to get things done, even if they are challenging. I have something wrong with me that involves high anxiety, and because of this I've given up easily in the past. But my parents and grandparents try to keep me going and get whatever I was doing done, even if it's difficult. And in general, I'm not entirely sure that I'm a leader, because I've never been given the chance. Maybe on the internet, but in real life it is truly a whole different story. I may be able to lead, but I have yet to see myself doing it. Wait, I have. I remember when I did (multiple times), but I do not feel like talking about it right now. Maybe another time. Found out that I do not have a choleric personality. But I'm a lone wolf, and they may or may not be leaders. Also, you don't know if you're a leader or not unless you are placed in that position and see what you do. Talked with my grandmother about it a couple days ago. @Nesanel Thx, spent about 2 hours photoshopping the colors and sigs. I found on the internet to adjust and compile it to my liking. I also agree on the leader part. A great man once said, "Great leaders only rise out of turmoil." (or a serious/ dire situation that demands leadership and guidance) One of the hardest role of a leader is probably getting other members of the group/ team to listen to you and place their utmost trust in you in leading them. Yes, and I'm not sure if I can do that. Yet. I might have been in that type of situation, but to be honest I cannot remember it if I was. Also, you don't know if you're a leader or not unless you are placed in that position and see what you do. Gengkiskan? Nesanel? A little help here please? From what I have seen, I believe Rocky is in the same situation I'm in. What situation are you in? Lol. The one with not knowing if you're a leader, lone wolf, and (correct me if I'm wrong) having problems in your family (your brother told me a couple years ago. Never forgot it.). WWWAAAAAARRRRR......I approve. also, HIIIIII tigirosa. I am Dart Ichimonji, but you may call me Dart Ichimonji. And meh, we're all lone wolves in some aspect or another, I think just as long as you can set it aside when you need to you're good. Nobody needs a crapload of friends, it only takes a couple good ones. Well, I'm the class president, have been for 7 months now. Not a lone wolf neither, I prefer being with friends, pretty much all the time. Problems with family? Again no. Girlfriend maybe, family no. And I will settle for making the world so blood-crazy that every day is a war amongst the people. Or just wandering while leaving destruction in my wake. Whichever comes first. ^ Wouldn't that leads to the destruction of all humanity? Or extinction? Personally, I would rule the world with my power, and rid it of crazy, but at the same time dangerous and wealthy people. (Definitely North Korea leaders). And maybe destroy too-good people on the way. ^ meh, the strong will survive, have strong babies, war begins again, the cycle repeats. Endless battles my friend, what more can a berserker ask for? Wouldn't it be more beneficial for us to conquer the world, reserve bacon and pie for us, then make everyone operate by our rules? 1. I'm jewish, so I've NEVER had bacon in my life. EVER. 2. We are quite off-topic here. Get on topic or I will be forced to lock this thread. 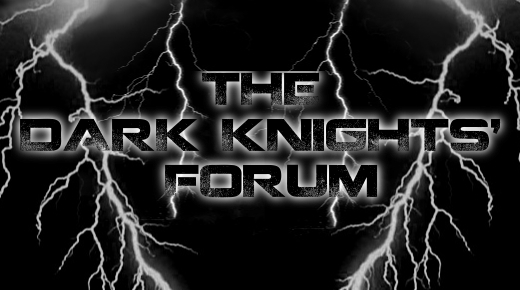 Subject: Re: Leaders of the Dark Knights: What do they mean to you?